So…you may have noticed (or not) that I was absent from posting last week. I was spending time with my adorable grandson and his parents. We had all kinds of adventures; the beach, Balboa Park, the pool, and, of course, the Hotel Del Coronado for a fabulous sunset. And I did actually get last weeks (#280) Diva Challenge completed, I just didn’t get it posted. And now, the Olympics are over. I was pretty underwhelmed by them this year, and watched none of the coverage. I am usually all over that…not sure what my issue was. I used a Renaissance Tan Zendala because I thought, well, Rio and tans and Arukas looked like Carnival to me. And we also had a fun class exploring the Tints on Tan technique by Marty Deckel. And who knew wearing 2 pairs of glasses was better than one! But…I did this weeks (#281) study of ING to complete the page in my step out Tangle Journal…so I almost feel like I was cheating, because it was nearly complete already. Not sure if you can tell, but there are actually 2 rows of ING there, with the pearls separating them. I like it. ING was the “new” tangle for my CZT Seminar (#14) and I love it’s angular-ness. Very architectural! I have finished a few other pieces this week…tried Lynn Mead’s Abeko in my purse journal, along with a Zedbra frame I had already started. I am happy to say that I have both the September AND October Schedules up on the site now, so be sure to check out the upcoming classes. I will be on vacation for a little while during that time, but will be working around it! AND…drum roll…Risa Gettler will be teaching BOTH Italic AND Gothic Calligraphy starting in October at the shop! I’ll be adding those dates to the schedule in the next few days. EXCITING! Did you know you can order online from me? Check out my Square store linked here…I am in the process of adding more pictures and spiffing up the online shop…everything your tangly heart needs! So…not sure if anyone remembers an old US television program from the 1960’s called The Wild Wild West. They did a movie one off of it a few years back with Will Smith, but the original series featured Robert Conrad. He was rather like William Shatner in Star Trek, he always got to make out with the girls, shirtless scenes, and really questionable acting skills. So, what made me think of this was that all of the episodes of The Wild Wild West all started with “The Night of…” for at least the first 2 seasons. But…it was still under warranty, and they are sending out a new one post-haste. So the second night of this week is actually a Knight(star). This week’s Diva Challenge (#278) was to use Daniel Lamothe’s tangle Knightstar. Daniel is one of our newer, and probably youngest, CZTs. He came up with this whilst in math class, and I think its pretty keen. He did a video for it you can see here, and as you can see, I did some step outs, of a sort, for it. Cool stuff! Lots of fun things going on at the shop this week. 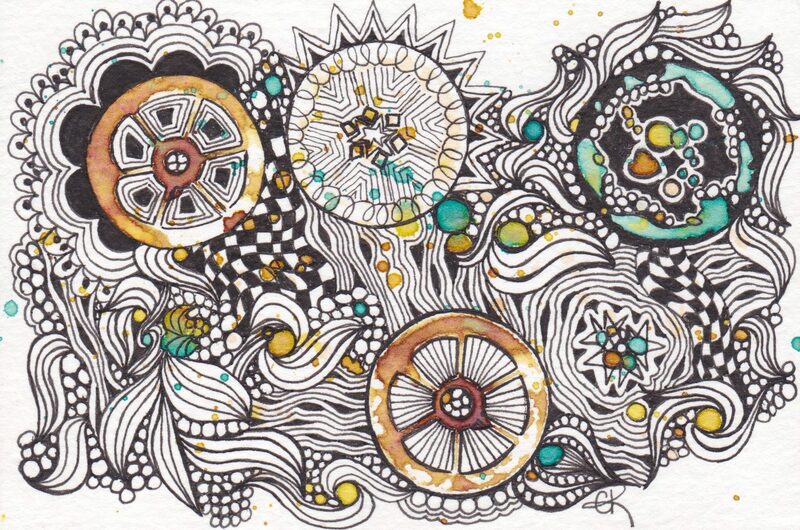 Saturday was a Zentangle 101 class, which was a lot of fun. We had time to explore a “what if” with Crescent Moon, and did that on some ATCs at the end of class. Sparkle does not photograph well, but this one has an iridescent background sprayed through a stencil on black paper. Use the Moonlight 06 to draw on top of it. And this was hibiscus tea, sprayed through a stencil. Tangled with purple LePen and Metallic Gelly, shaded with purple Chalk Pastels. On Garza Papel and I am not sure why it looks yellowish, but it is very white. And I started this one…on a day when I was a little down in the dumps, but it made me happy when I got at least the basic outline done. Designed with Margaret Applin’s Medallion Master Series stencils. Laid out on Stonehenge White 24 x 24 inches. So…I think that’s enough to entertain you for this week. I’m off to further lament the death of my FitBit…at least it updated for the day before it died, so have last weeks totals. Stay Crazy My Friends…Catch Them All.